All contents copyright © 1984 Geoscience Research Institute. Major catastrophic occurrences on Earth are infrequent. Explanation of events even in recent historical times can prove to be most difficult. A catastrophe may be defined as a natural event of large magnitude (energy), short duration, wide extent and low frequency. The Tunguska (pronounced: toon-goos'-ka) explosion of 1908 fulfills all five parts of the above definition and can be considered the epitome of a cosmic impact catastrophe. An understanding of this unique event and its origin could provide insight into large ancient asteroidal or cometary collisions with the Earth (e.g., Sudbury and Popigay impact structures) and possible global catastrophic effects (e.g., from flooding, tectonism, volcanism, glaciation and air blast waves). Catastrophism, a doctrine spurned by uniformitarian scientists in the twentieth century, is now being confirmed by events which have occurred in this century. The scientific interest stimulated by the Tunguska explosion of 1908 has produced enormous speculation and controversy as to its origin. The theories offered by those who have studied the event range from the realm of science (a meteorite, comet, or nuclear explosion) to the realm of science fiction (a black hole, anti-matter rock, or an alien spacecraft). Each theory has protagonists promoting and defending their point of view in light of the evidence, yet, because the scientific community did not view the actual event, but only observed the devastating results (it was 19 years after the impact before the first scientist arrived on the scene), each theory contains some speculation. Before delving into the specifics of each theory, it is important to review the actual facts of the event. The Tunguska explosion occurred on the morning of June 30, 1908 at 7:17 A.M. local time (0h 17m 11s U.T.) in the area of the Stony Tunguska River with the coordinates of the epicenter being 60º55' N, 101º57' E (Kridec 1966). This location is in the central Siberian area of Russia, approximately 1000 km north of the town of Irkutsk and Lake Baikal (Figure 1). FIGURE 1. Area map of the 1908 Tunguska explosion event. After Sullivan 1979. ...the peasants saw a body shining very brightly (too bright for the naked eye) with a bluish-white light.... The body was in the form of 'a pipe', i.e. cylindrical. The sky was cloudless, except that low down on the horizon, in the direction in which this glowing body was observed, a small dark cloud was noticed. It was hot and dry and when the shining body approached the ground (which was covered with forest at this point) it seemed to be pulverized, and in its place a loud crash, not like thunder, but as if from the fall of large stones or from gunfire was heard. All the buildings shook and at the same time a forked tongue of flames broke through the cloud. All the inhabitants of the village ran out into the street in panic. The old women wept, everyone thought that the end of the world was approaching (Kridec 1966). ...I was sitting in the porch of the house at the trading station of Vadecara at breakfast time...when suddenly in the north...the sky was split in two and high above the forest the whole northern part of the sky appeared to be covered with fire. At that moment I felt great heat as if my shirt had caught fire; this heat came from the north side. I wanted to pull off my shirt and throw it away, but at that moment there was a bang in the sky, and a mighty crash was heard. I was thrown to the ground about three sajenes [about 7 meters] away from the porch and for a moment I lost consciousness.... The crash was followed by noise like stones falling from the sky, or guns firing. The earth trembled, and when I lay on the ground I covered my head because I was afraid that stones might hit it (Kridec 1966). Through comparison of old seismograms of the Tunguska event and seismograms of the decaya Zemlya and Lop-Nor nuclear-weapon tests, Ben-Menahem (1975) determined that the Tunguska projectile had "the effects of an Extraterrestrial Nuclear Missile of yield 12.5±2.5 megatons." This is approximately 3 orders of magnitude greater than the Hiroshima A-bomb and about one-fifth the energy of the largest hydrogen bomb explosion (McWhirter and McWhirter 1974). The height at which the explosion occurred was estimated to be approximately 7.5 km, with a total energy release of approximately 3×1023 ergs, 5×1018 ergs of which was changed into seismic energy (Ben-Menahem 1975). More energy went into the air blast than the earthquake. F.J.W. Whipple (1930) estimated the energy of the air blast wave to be 3.2×1020 ergs. The seismic activity measured on the Richter scale was 5.0; and the air compression wave went twice around the world, according to recordings at meteorological stations. The projectile traveled in a southeast to northwest direction with a 60º azimuth, according to Fesenkov (1966) who made use of eyewitness accounts and an inspection of the radial symmetry of the trees at the explosion site. This direction was probably immediately prior to the explosion; however, there are conflicting reports as to the actual line of flight (discussed later when dealing with the causal theories of the Tunguska explosion). The temperature at the center of the fireball was estimated by one source to be up to 30 million degrees Fahrenheit (LeMaire 1980). Some storage huts in the nearby vicinity of the focus were found devastated by fire and the silverware and tin utensils within were deformed by intense heat. "Preceding the front of the shock wave there arises a heated zone whose radiating surface area is far larger than that of the shock wave itself" (Stanyukovich and Bronshten 1961). This is substantiated by Semedec who first felt the heat wave, then was thrown to the ground by the air shock wave. The inhabitants of Central Siberia saw the fall and explosion of the meteorite over an area with a radius of 600-1000 km. Eighty million trees in the taiga (coniferous forest) were uprooted and blown down for a radius of 30-40 km (F.J.W. Whipple 1934). Some trees on the leeward side of hills were somewhat protected, yet still had their branches broken off and bark stripped to leave them standing naked, resembling telegraph poles. After the impact, forest fires broke out and ravaged an area of 10-15 km in radius (Astapowitsch 1934). Kridec (1960) describes these forest fires as being unnatural. The trunks of trees and their branches were not burned through but were only scorched on the surface. Apparently a searing heat wave caused the scorching, yet a conventional forest fire was not present. Some trees were entirely scorched in standing position, but were bent away from the epicenter. In normal fires in the Vadecara area, trees remained vertical with fire damage occurring at the lower sections while the tree tops remained untouched. It is also interesting to note that some trees which had been stripped of bark showed no signs of scorching (Kridec 1963). The nights following the Tunguska meteorite were anomalous. Abnormally bright nighttime illumination was reported throughout Europe and Western Russia to the extent that people could read news print at midnight without artificial lighting (Kridec 1966). The cause of the anomalous illumination of the night sky is discussed later. The Russian government made no immediate attempt to investigate the event, due to its internal political upheavals at the time of the explosion, and because the incident occurred in such a desolate area without harming anyone. In 1921, the country's fledgling Academy of Sciences appointed L.A. Kulik, a science worker at their Mineral Museum, to head a team of investigators who would travel through Siberia with the purpose of gaining information concerning meteorites from the local populace. Kulik collected newspaper articles and questioned eyewitnesses in his attempt to pinpoint the time and location of the Tunguska fall. However, due to the lateness of the year (late autumn), the expedition did not attempt to maneuver through the taiga to investigate the impact site. In his four succeeding expeditions covering 1927-1939, Kulik obtained many sensational eyewitness accounts concerning the Tunguska meteorite. In a local newspaper, the reporter described the bolide (a bright, detonating fireball) itself as a "body of fiery appearance" and a tail (probably a dust trail) as a "radiance." Other articles described "a fiery body like a beam shot from south to north west" with "a tongue of fire" appearing in place of the fiery bolide (Kridec 1966). One witness to the event, a train engineer, said he felt "a kind of strong vibration of the air," then heard a "roar" which he believed to be "an earthquake or some other natural phenomenon," and which frightened him to the extent that he stopped the train thinking that it had gone off the rails (Kridec 1966). In fact, when he arrived at the station, he asked for an inspection to locate the problem on the train. Another eyewitness reported that a thousand reindeer owned by the Evenki people were killed and many carcasses burned by the ensuing forest fire. It was one of the Evenki people, Okhchen, who eventually led Kulik to the impact site (Kridec 1966). Potapovich, who served as a guide for Kulik, told Kulik that "his brother's hut was flattened to the ground, its roof was carried away by wind [apparently some sort of tent structure], and most of his reindeer fled in fright. The noise deafened his brother and the shock caused him to suffer a long illness" (Kridec 1966). Potapovich's brother lived on the Chambe River located just outside the limit of the tree damage (Figure 2). FIGURE 2. Map depicting fallen tree pattern (arrows represent direction) from explosion of 1908. This is a closeup of the impact site of Figure 1. After Sullivan 1979 and Kridec 1966. In the trading station at Vadecara, Kosolapov reported to Semedec (previously mentioned) "a fierce heat scorched my ears. I held them, thinking the roof was on fire...." Windows broke and the oven door on Kosolapov's stove flew off and landed on the bed across the room (Kridec 1966). At that time I was ploughing my land at Narodima (6 km to the west of Kezhma). When I sat down to have my breakfast beside my plough, I heard sudden bangs, as if from gun-fire. My horse fell on its knees. From the north side above the forest a flame shot up. I thought the enemy was firing, since at that time there was talk of war. Then I saw that the fir forest had been bent over by the wind and I thought of a hurricane. I seized hold of my plough with both hands, so that it would not be carried off. The wind was so strong that it carried off some of the soil from the surface of the ground, and then the hurricane drove a wall of water up the Angara [a seiche perhaps]. I saw it all quite clearly, because my land was on a hillside (Kridec 1966). After having obtained interesting and tantalizing eyewitness and newspaper accounts during his 1921 expedition, Kulik was anxious to reach the Stony Tunguska River region to locate the impact site of what he ascertained to be a meteorite. In 1927 Kulik was able to return to search for the Tunguska meteorite. After spending some time in Vadecara, Kulik made arrangements for Evenki hunters to guide his party to the impact site. Reaching the explosion site was an extremely arduous task. The spectacle that confronted Kulik as he stood on a ridge overlooking the devastated area was overwhelming. He saw an area where trees up to three feet in diameter had snapped like toothpicks, were uprooted and strewn across the landscape. Upon closer examination, he located holes which he erroneously concluded were meteorite holes; however, he did not have the means at this time to excavate them. During Kulik's three succeeding expeditions to determine the cause of the Tunguska event, his meteorite theory received no substantiating evidence. Despite tremendous hardships caused by the searing heat of summer, the coldness of winter and insufficient funds for supplies and equipment, Kulik and his party persevered to obtain evidence relating to the Tunguska explosion. Throughout his investigations and those of others covering a total of fifty years, there was no evidence of impacting iron, no impact craters, no meteorite remnant and no strewn field of particles. The only evidence left by the Tunguska bolide was toppled and burned trees. The holes that Kulik thought to be from meteorites proved to be natural depressions. Due to a lack of evidence for the meteorite theory proposed by Kulik, other theories were proposed to explain the Tunguska event. Various authors (Cowan, Alturi and Libby 1965; Kridec 1960, 1966; Hughes 1976) have designated F.J.W. Whipple (1930-1934) as the initiator of the cometary hypothesis. Whipple proposed "that the meteor was essentially a small comet and that the tail of the comet was caught by the atmosphere" (F.J.W. Whipple 1934). However, in the same article only two paragraphs later, he stated: "I do not feel much confidence in this hypothesis." It appears unlikely, therefore, that the Tunguska explosion was produced by a bona fide active comet a hundred or so meters in dimension.... more likely, however, the Tunguska object was an inactive, low-density, friable body.... There is no reason to suspect that it was interstellar. It is an understatement to suggest that the origin of the Tunguska explosion is controversial. There are various elements of the cometary hypothesis that explain the eyewitness accounts and the associated physical data. Probably the most important concept supporting the comet hypothesis is the nature of flight of the Tunguska fireball. Fesenkov (1962) claims, "According to all evidence, this meteorite moved around the Sun in a retrograde direction, which is impossible for typical meteorites...." Fesenkov notes that meteorites rarely hit the earth in the morning, because the morning side faces forward in the planet's orbit. Usually the meteorite overtakes the earth from behind, on the evening side. However, comets have a wide range of orbits and velocities and could collide with the earth on the morning side, hitting head on at a velocity of approximately 60 km/sec (130,000 mph or Mach Number 180). Fesenkov (1966) demonstrates that the direction and angle of the attack toward the earth was from behind the sun; thus, the glare of the sun prevented sighting. In addition to the evidence of the bolide's retrograde orbit was the brilliant night sky observed in Europe and Western Russia. Fesenkov (1966) points out that there was no anomalous glow on June 30, 1908, but that there was such a glow on July 1, 1908. There was no unusual illumination reported in the U.S., the southern hemisphere or in countries east of the explosion site. "The most probable explanation for the anomalously bright nights associated with the Tunguska meteorite fall would be that the meteorite was actually a little comet with a dust tail pointing away from the sun" (Fesenkov 1966). "These properties of the [dust] distribution can be explained if the cloud of cosmic particles was associated directly with the nucleus of the Tunguska comet, and pointed in a direction away from the sun" (Fesenkov 1966). This is a plausible explanation in regard to the brilliant nights observed in Europe. No other theory offered adequately explains this anomaly. More evidence supporting a comet came to light in 1962 when technicians discovered microscopic pellets of magnetite and silicate globules, thought to be extraterrestrial, in soil samples from the Tunguska explosion site. A double spherule consisting of a magnetite pellet inside a larger silicate shell is unique to this event and thought to be the result of "rapid condensation of incandescent gas upon cooling" (Fesenkov 1966). The final piece of evidence for the Tunguska comet explains physical observations satisfactorily. According to Whipple's model described above, the comet probably exploded prior to impact with evaporation of the components thereby leaving no remnant. By comparing the records of air waves from various sources, Ben-Menahem (1975) deduced that the height above ground where the explosion occurred was 7.5 km. 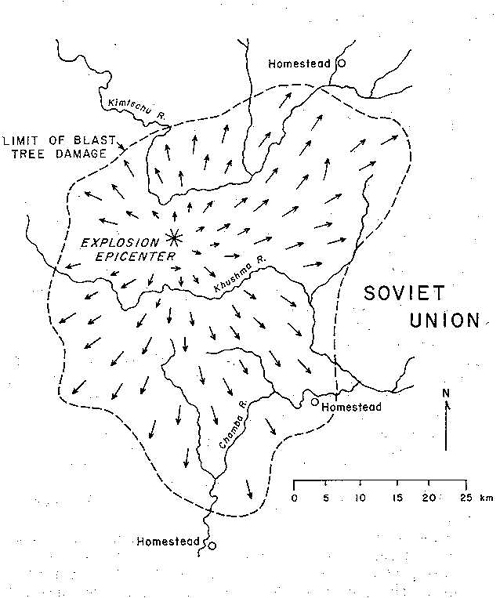 There appear to have been three radiant centers made by fallen trees, according to Fesenkov (1966), which would indicate multiple explosions. F.J.W. Whipple (1930) noted that the air wave recorded on the microbarographs appears to indicate two types of waves; one generated by penetration of the object into the atmosphere, and the other generated by the explosion or explosions. The similarity between the Hiroshima A-bomb devastation and the mysterious Tunguska effects gave rise to the notion that the 1908 event was caused by a man-made nuclear bomb. The fictional writings of the Soviet author Alexander Kazantsev in 1946 were the first to pick up the idea which scientists later considered. A prominent Soviet scientist, Alexei Zolotov, after a 17-year investigation, expanded the nuclear explosion theory by supposing it was caused by the visit of an alien spacecraft (TASS news release, mid-October 1976). According to Zolotov, a spaceship controlled by "beings from other worlds" may have caused the 1908 explosion. He imagined a nuclear-propelled craft that exploded accidentally due to a malfunction. Zolotov also admits to problems with the theory, realizing that safety devices would probably prevent such a mishap, and observing that the actual area of destruction was "an amazing demonstration of pinpoint accuracy and humanitarianism." T.R. LeMaire, a science writer, continues this thought, by suggesting "The Tunguska blast's timing seems too fortuitous for an accident" (LeMaire 1980). He claims that a five-hour delay would make the target of destruction St. Petersburg, adding that a tiny change of course in space would have devastated populated areas of China or India. Can we assume that the 'pilot' chose a cloudless day with excellent visibility from aloft to assure a safe drop? American Military strategy called for identical weather conditions; for a perfect strike on Hiroshima's industrial heart, the Enola Gay's bombardier was forbidden to release through a cloud cover: he had to see the target below. To maximize blast destruction, minimize radiation perils: the bomb was set to explode at a high altitude rather than against the ground. Similarly, the Siberian missile detonated high in the air, reducing or even eliminating fallout hazard (LeMaire 1980). The body approached from the south, but when about 140 miles from the explosion point, while over Kezhma, it abruptly changed course to the east. Two hundred and fifty miles later, while above Preobrazhenka, it reversed its heading toward the west. 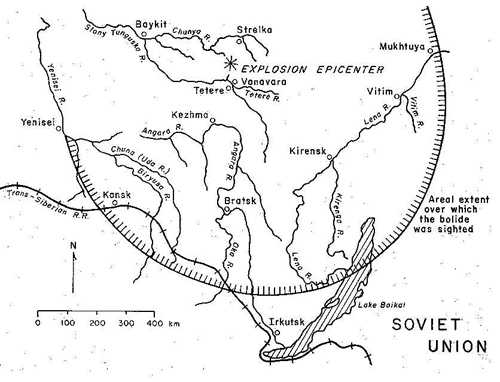 It exploded above the taiga at 60º55' N, 101º57' E (LeMaire 1980). Scientists who have reviewed eyewitness reports are not convinced of any course changes as the brilliant object traversed the sky. Neither are scientists convinced of nuclear temperature. Brown and Hughes (1977) state that a temperature of two million degrees Celsius (the supposed temperature obtained if all the kinetic energy of the comet, 3×1023 ergs, was changed into heating the component parts) is "substantially subnuclear." Furthermore, it is entirely fallacious to suppose that the sub-nuclear temperatures cannot produce nuclear effects...." They suggest that a thermo-chemical explosion could produce the effects of a nuclear bomb. The anti-matter hypothesis is offered by Cowan, Alturi and Libby (1965) and supported by Gentry (1966). This theory proposes that an anti-rock composed of anti-matter was annihilated in the atmosphere above the Tunguska explosion site and caused the observed damage. Cowan et al. postulated that such an explosion would cause an increase in atmospheric radiocarbon. Upon analysis of C-14 content in a 300-year-old Douglas fir from Arizona, they believe that they obtained increased radiocarbon for the time of the event. However, the data presented in their paper appear to lack statistical significance for support of their conclusions. Furthermore, careful C-14 measurements of a tree nearer the blast fail to show an increase in 1909 (Lerman et al. 1967). The last theory as to the cause of the Tunguska event is proffered by Jackson and Ryan (1973). They suggest that a black hole with a mass of 1022 to 1023 g would have the necessary energy (1023 ergs) to have caused the Tunguska destruction. Jackson and Ryan maintain that the black hole would cause the destruction as it pierced through the earth with the ease of cutting soft butter, exiting the earth through the Atlantic Ocean. Beasley and Tinsley (1974) refute the black-hole theory because the microbarographs that recorded the air waves of the explosion did not record air waves of an exit point in the Atlantic Ocean. This is vital to the black-hole theory because the exit of the black hole from the earth would be expected to exhibit devastating effects similar to those at its entrance. The black-hole concept also does not explain the magnetite and silicate globules found in the explosion region, nor does it account for the anomalously bright night sky observed over Europe. Beasley and Tinsley (1974) conclude, "All the evidence favors the idea that the impact which caused the Tunguska catastrophe involved a body with characteristics like a cometary nucleus rather than a black hole." The Tunguska explosion is indeed unique and mysterious. Of the possible causes it appears that the present consensus favors the comet hypothesis. However, suggesting a consensus is quite tenuous. Though the other theories have plausibility, they have difficulty explaining the observed event and the resulting physical evidence. Making use of the cometary hypothesis allows for the following probable scenario. Above central Siberia on June 30, 1908, at approximately 7:17 AM local time, a small comet entered the atmosphere from behind the sun and moved in a southeast to northwest direction. The comet was composed of about 30,000 tons of water, methane, and ammonia ice with traces of silicates and iron oxides. Penetrating the atmosphere at approximately 60 km/sec (130,000 mph), the object created an intense shock wave which wrapped tightly around its nose. As it descended that sunny morning, its nucleus exploded (possibly 3 times) approximately 8 km above the Earth's surface. A huge black cloud immediately appeared following the explosion which released 1023 ergs of energy. A heat wave with a temperature of approximately 16.6 million degrees Celsius at the focus was generated that had a tree-scorching effect for a radius of 15 km. The heat wave was followed by air shock waves which disfigured or toppled 80 million trees occupying approximately 8000 km2 of Siberian taiga (a radius of 30 km), and initiated a seismic wave of Richter magnitude 5, but, to our astonishment, left no crater. The dust from the tail of the comet moved away from the sun and provided anomalously bright night sky in Europe and parts of Western Russia. No trace of the comet itself was found except for tiny magnetite and silicate globules. The principal consequences were fear and awe among the inhabitants of the region, and the physical damage from the explosion. Fortunately, no human life was lost, though more than a thousand reindeer were destroyed. Speculation will continue as to the origin of this catastrophe, yet no certain conclusions can be attained unless man has the dubious opportunity to observe and monitor such an event in the future. The Tunguska explosion directs our attention to catastrophic forces which have helped form the earth, and causes us to ask questions about the nature of much larger cosmic events. What were the global effects of enormous impact events which formed the 1-km-diameter Meteor Crater in Arizona, the 100-km-diameter Popigay crater of Siberia, and the 140-km-diameter Sudbury impact structure of Ontario? What changes in the earth's crust, atmosphere, ocean and life were caused by the release of a million times more energy than the Tunguska explosion? The Tunguska event provides a faint glimpse. Astapowitsch, I.S. 1934. Air waves caused by the fall of the meteorite on 30th June, 1908, in Central Siberia. Royal Meteorological Society Quarterly Journal 60:493-504. Beasley, W.H. and Tinsley, B.A. 1974. Tungus event was not caused by a black hole. Nature 250:555-556. Ben-Menahem, Ari. 1975. Source parameters of the Siberia explosion of June 30, 1908, from analysis and synthesis of seismic signals at four stations. Physics of the Earth and Planetary Interiors 11:1-35. Brown, J.C. and Hughes, D.W. 1977. Tunguska's Comet and non-thermal C14 production in the atmosphere. Nature 268:512-514. Cowan, C., Alturi, C.R., and Libby, W.F. 1965. Possible anti-matter content of the Tunguska meteor of 1908. Nature 206:861-865. Fesenkov, V.G. 1962. On the cometary nature of the Tunguska meteorite. Soviet Astronomy 5(4):441-451. Fesenkov, V.G. 1966. A study of the Tunguska meteorite fall. Soviet Astronomy 10(2):195-213. Gentry, R.V. 1966. Anti-matter content of the Tunguska meteor. Nature 211:1071-1072. Hughes, D.W. 1976. Tunguska revisited. Nature 259:626-627. Jackson, A.A. and Ryan, M.P. 1973. Was the Tungus event due to a black hole? Nature 245:88-89. Kridec, E.L. 1960. Principles of meteorites. Pergamon Press, Oxford. Kridec, E.L. 1963. The Tunguska and Sikhote-Alin meteorites. In B. Middlehurst and G.P. Kuiper, eds. The Solar System, Vol. IV: Moon, Meteorites and Comets, pp. 208-217. University of Chicago Press, Chicago. Kridec, E.L. 1966. Giant meteorites. Pergamon Press, Oxford. LeMaire, T.R. 1980. Stones from the stars. Prentice Hall, Englewood Cliffs, New Jersey. Lerman, J.C., Mook, W.G., and Vogel, J.C. 1967. Effect of the Tunguska Meteor and sunspots on radiocarbon in tree rings. Nature 216:990-991. McWhirter, N. and McWhirter, R. 1974. Guinness book of world records, 1975. Sterling, New York. Stanyukovich, K.P. and Bronshten, I.A. 1961. Velocity and energy of the Tunguska meteorite. Doklady Akademii Nauk SSSR, earth sciences sections 140:1053-1055. Sullivan, W. 1979. Black holes, the edge of space, the end of time. Doubleday, Garden City, New York. Thorndike, J.J., Jr., ed. 1977. Mysteries of the past. American Heritage Publishing Company, New York. Whipple, F.J.W. 1930. The great Siberian meteor and the waves, seismic and aerial, which it produced. Royal Meteorological Society Quarterly Journal 56:287-304. Whipple, F.J.W. 1934. On phenomena related to the great Siberian meteor. Royal Meteorological Society Quarterly Journal 60:505-513. Whipple, F.W. 1950. A comet model I. The acceleration of the Comet Encke. Astrophysical Journal 111(1):375-379. Whipple, F.W. 1975. Do comets play a role in galactic chemistry and gamma-ray bursts? The Astronomical Journal 80(7):525-531. * Dr. Steven A. Austin has a B.S. from the University of Washington, an M.S. from San Jose State University, and a Ph.D. from the Pennsylvania State University, all in geology. He is well known as a Professor of Geology at the Institute for Creation Research, San Diego, California, and for his research at Mt. St. Helens and in Grand Canyon.